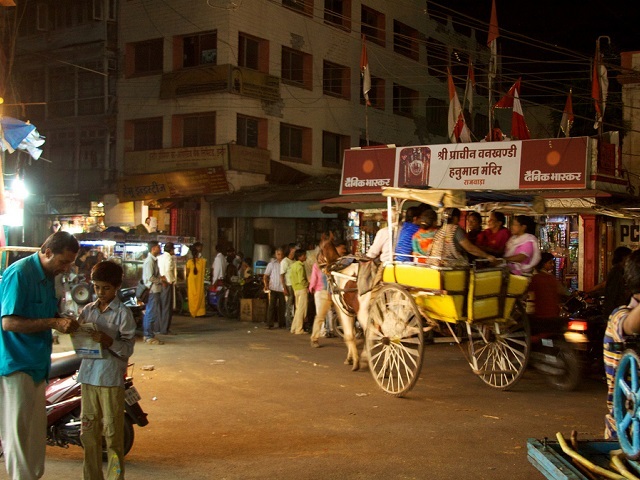 The city of Indore, India, is a pilot city for the creation of a new Health Impact Assessment methodology that will be used to evaluate the potential impacts of transport developments and policies on city residents. Photo by McKay Savage/Flickr. India alone accounts for about 10% of traffic fatalities worldwide. Fourteen lives are lost every hour, totalling 330 people that die each day on India’s roads. Out of this number, pedestrians comprise 21% of these deaths. In order to combat these fatalities, Health Impact Assessments (HIAs) should be used to evaluate the potential impacts of traffic developments and policies on city residents. Recently on TheCityFix, we discussed why Health Impact Assessments should be an integral part of transport policy and planning. Today, we’ll take a closer look at how this plays out in the Indian context. The dominant Health Impact Assessment model was not originally intended to address the transport sector, nor was it optimized to work for the kinds of problems faced by developing countries. To create a more contextually appropriate Health Impact Assessment model, EMBARQ India developed a methodology focusing on modal shift – when users switch from one transport mode to another – and vehicle kilometers traveled (VKT) for Indian cities, where measurement of health outcomes can be difficult and resource-intensive. This model was then used to evaluate the health impacts of the recently implemented bus rapid transit (BRT) corridor in the city of Indore, Madhya Pradesh. The case of Indore reveals the immense potential of Health Impact Assessments to benefit the safety and health of people in emerging economies. One of the first components of this new Health Impact Assessment methodology is a baseline assessment of the current impacts unsafe transport options have on Indore’s residents. Motorized two-wheelers and unorganized public transport – like auto-rickshaws, mini buses and vans – contribute to around 85% of greenhouse gas (GHG) emissions in Indore. A 2012 study from EMBARQ India and TARU identified vehicle traffic to be the primary source of air pollution and also found very high concentration of particulate matter levels in several areas of Indore. This rapid increase of motor vehicles in Indore has contributed to an equally rapid decline in air quality. Increasing air pollution has a corresponding effect on citizens’ health. High PM10 – one of two types of particulate matter – values can cause respiratory health problems such as coughing, wheezing, and reduced lung function; 20 million people already suffer from asthma across India. Outdoor air pollution caused an estimated 620,000 deaths in India in 2010, a six-fold increase from 2000, and is the fifth leading cause of disease in India. Acute respiratory infections are one of the most common causes of deaths in children under five in India, and they contributed to 13% of in-patient deaths in pediatric wards in India in 2013. Roughly 1.6 million Indians died in 2012 from traffic crashes, a 73% rise from 2001 that is estimated to further increase by 200,000 deaths and 3 million hospitalizations by 2015. The health impacts of transport projects significantly impact economic vitality for cities and communities. The exposure to air pollution and increase in vehicles increases the cost to society via visits to the emergency room, hospital admissions and missed days of work and school and is estimated at a loss of 3% of India’s GDP. This translates into a loss of 4522.96 million Indian Rupees (INR) (US$ 113.08 million) for a 50 micrograms per cubic meter increase in PM10, also known as an increase in ash-sized particles that can be inhaled and accumulate in the lungs, leading to lowered immune systems, cardiovascular disease, and lung cancer. The damages caused by an increase in vehicles and air pollution levels is significant, yet findings from Indore show that with proper attention to the health impacts of transport developments, the gains from shifting people from cars to sustainable transport are also vast. It is estimated that those who switch from cars to bicycles gain three to 14 months on their lives on average. Additionally, should Indore maintain its BRT network, the city can save an estimated 19 lives per year after 2014, resulting from the reduction in traffic fatalities from fewer vehicles on the road, reduced exposure to air pollution, and increased physical activity. In order to accurately estimate the health impacts of transport, more research is needed to develop tools that more accurately reflect the environmental context of India and other developing countries. This is especially true of measuring physical activity, for which there is the least data available. The case study of Indore has laid an important foundation for assessing the potential impacts of new urban developments, but there is still more work to be done. For example, the poor in India are the most vulnerable to air pollution exposure and road accidents because they are the largest proportion of pedestrians and cyclists. The equity issues related to the health impacts of transportation decisions also require careful study and consideration, for a Health Impact Assessment that brings positive benefits to only part of the population is not truly successful. The pace and scale of environmental, social, and economic change occurring across India contributes to the urgency of applying the models created in Indore across all of India. Growing demand for motor vehicles and an increasingly affluent populace are widening inequality and exacerbating the health impacts on the most disadvantaged portions of society. Health Impact Assessment can help evaluate the economic benefits of transportation projects, complementing the usual metrics like time savings and reduction in operational costs, to help policy makers choose the most sustainable and socially responsible development projects, creating healthier, safer cities for all residents.